Love your smile again without missing a thing! The premier solution to replace one or multiple missing teeth. Our dental implants in Redmond, WA look, feel, and function like the real thing. In other words, you can finally have the confidence to smile, eat, and speak without having to worry about slipping and sliding dentures. With extensive training in placing and restoring dental implants, our Redmond dentist places and restores your implant right in the office. This means you do not have to bounce around from office to office to gain the smile you deserve. WHY CHOOSE DENTAL IMPLANTS OVER OTHER ALTERNATIVES? Resembling natural teeth, dental implants simulate the tooth root, giving back your smile’s function and beauty. Plus, they are engineered to blend with your smile beautifully. How else can they help you? Dental implants from our experts in Redmond are created to match your natural teeth. Whether you need a single tooth implant or are looking to replace multiple teeth, our dentists will make sure your implant blends seamlessly with your smile. When you have a missing tooth, the jawbone loses support and starts to deteriorate causing bone loss, making your face appear saggy. Since implants mimic the tooth root, it stops the deterioration process and stabilizes your jawbone and facial support. Do you have slippery or sliding dentures? You may have issues with speech, such as mumbling or slurring your words. Since dental implants are placed firmly into your jawbone, you can speak confidently without the worry of your teeth slipping. With missing teeth or unstable dentures, it's challenging and painful to chew and eat your favorite foods. This inconvenience could deter you from getting the proper nutrients. With implants or implant-retained dentures, you'll have the stability to eat and chew with confidence. The best part of dental implants from our dentist in Redmond is they are permanent. They are designed to fuse within your jawbone and blend in with the adjacent teeth to become a part of your natural smile. The materials used are fabricated to last a long time. As long as you maintain proper care through regular oral heath routines, your implant can last a lifetime. Other tooth or teeth treatment options to replace missing teeth (such as bridges and dentures) require reducing the size of your surrounding teeth to make room for the process. With implants from our Redmond dental offices, there is no need to prep your surrounding teeth, keeping your teeth and natural bone functional and healthy. WHY CHOOSE SMILE ARTISTRY FOR YOUR DENTAL IMPLANTS IN REDMOND? You'll have convenience and expertise all under one roof. Normally, you would have to travel to specialists to place the titanium post before getting the crown. This could result in miscommunication and inaccuracy. At Smile Artistry, our on-staff dentist has received advanced training to place and restore dental implants right in the office, making the implant process easy and predictable. Has vast experience in placing implants with the top implant masters and oral dental surgeons from across the country. Participates in continuing education for placing and restoring dental implants. With dental implants receiving a 98% success rate, you can trust your smile in the hands of Smile Artistry. Consult our FAQs below or give us a call! What can I expect with the implant process? 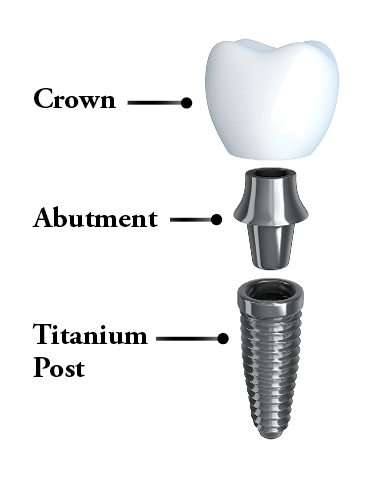 Implants have three parts: the titanium post, the abutment, and a crown. The process starts by placing the titanium post within your jawbone. During the healing process, the post will fuse with your jawbone, becoming the new tooth root. Once healed, the dentist will place the abutment onto the post to make room for the crown. From there, he will beautifully restore and blend the crown with your smile, creating a natural-looking tooth. You’ll walk out of our office with a beautiful smile. 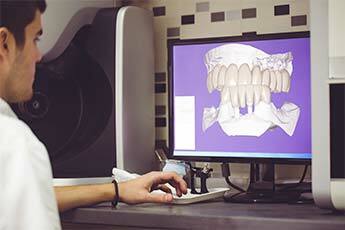 With the advancements in technology, there are many ways to have a secure artificial tooth. Single Implant Placement: The traditional method to replace single or multiple teeth where our dentists will place the titanium post, abutment, and crown. Implant-Retained Dentures: This is a great option for any denture wearers to create a secure and stabilized fit. With implant-retained dentures, multiple titanium posts are placed into the jawbone and then a denture is securely placed on top of the posts. This minimizes any slipping, clicking, or discomfort that can accompany poor-fitting dentures. All-on-4: This is the preferred method when you need a full arch of teeth. This includes placing four implants within the jawbone and placing a full set of teeth within that arch. If you’re tired of ill-fitting dentures, this option may be right for you. Call our office to learn more about the implant procedures we offer. It’s our number one priority to make sure you’re comfortable. Before starting, we’ll discuss all of our amenity options and methods to ensure you feel comfortable throughout the entire treatment. Hello dental implants and a beautiful smile. Schedule a complimentary consultation today to see if dental implants in Redmond are right for you.